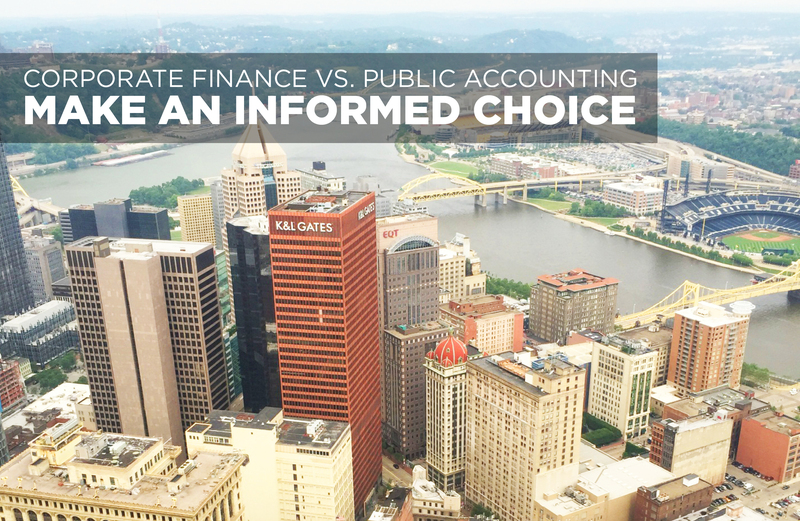 Corporate Finance vs. Public Accounting: Make an Informed Choice! As accounting students, professors often direct us toward careers in public accounting. Since most programs offer a Master’s, which provides the necessary requirements to sit for the Uniform Certified Public Accountant Exam, it seems like a logical choice. Public accounting affords exposure to numerous industries, allowing for professional growth and insightful experiences. However, through UPMC’s robust Summer Associates and Financial Management Rotation (FMR) programs, a recent graduate can achieve invaluable experience at a very large health care organization in multiple aspects of finance and accounting, comparable to any given experience at a public accounting firm. Hopefully my experience will encourage you in your professional pursuits. As I looked for an internship this past fall, I wanted the opportunity to work on exciting projects, grow and expand my professional network, and have access to mentors that could guide me in shaping my future career. I made the right decision in choosing UPMC’s program, for I achieved these goals and much more. During my time with Corporate Accounting, I was tasked with projects that allowed me to apply classroom theory to real life situations. For example, as team representative, I assisted in reconciling the cash accounts from a recent joint venture located in Wexford. While my skills were tested, I simultaneously felt trusted by my superiors to complete the task quickly and accurately. Additionally, this program expanded my professional network to include staff associates of UPMC, Summer Associates from varying parts of the country, and even the CFO of the entire UPMC organization. This extensive network now helps me identify leaders who might provide mentorship throughout the entirety of my career. Even in writing this blog post, I have reached out to leaders in public accounting and gained valuable insight from their experiences within their work realms. I consider this network an invaluable resource in deciding future career strategies. So, why did I choose corporate accounting and finance over public accounting? The reasons outlined above show my selection process for the internship, but let me reflect on the importance of choice for just a moment. As a business professional, the chance that you will change jobs multiple times within your career is high, and it is important to understand all available options. You must do what is best for you, both professionally and personally. My UPMC internship has planted lifelong insight and tools into my professional portfolio that I can certainly implement in the future. Not limited to technical skills in excel or PeopleSoft, these tools focus on soft skills such as presentation and proper business communication. Furthermore, being surrounded by leaders and mentors that showed genuine interest in my career and provided constructive feedback allowed me to grow professionally. When asked for help, every team member took interest in making sure I succeeded in my projects and daily responsibilities. Finally, UPMC’s strong commitment to maintaining a healthy work/life balance appeals to my personality. While working some hours beyond our standard schedule, flexibility, to seek our personal goals such as going back to school or spending time with family, was provided. The choice of corporate accounting vs. public accounting is a difficult decision for everyone, with personal preference for the differing environments often determining the best course of action. However, based on my professional and personal goals, as well as my experience in UPMC’s work culture, I strongly feel that the corporate finance and accounting environment is best suited for me. The choice is yours!